The excavations at Rocky Clump continued up until Christmas. A hardy section of the Field Unit examined a new area of archaeological features. An extension to the north/south ditch was anticipated, but the removal of top soil revealed a large area of dark fill to the north of the previously excavated site. 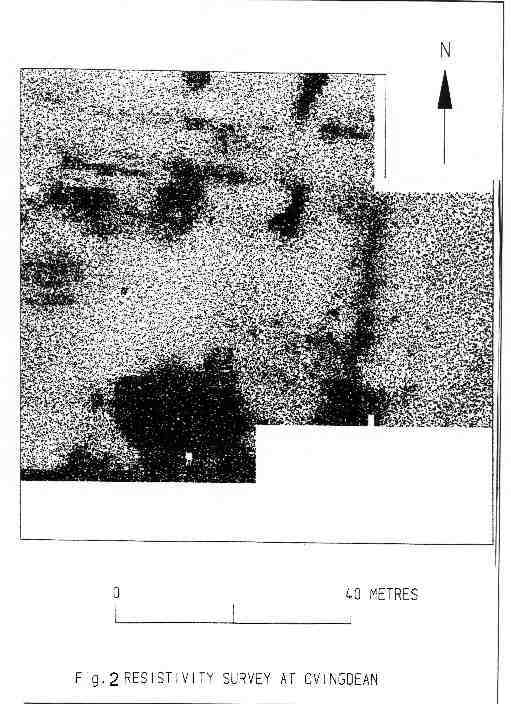 A geophysical survey in 1998 had provided interpretations of linear features suggesting a new building with an area of high resistance suggesting a possible floor. The new section of dark fill contains a considerable quantity of large flint nodules but not enough to classify it as a floor layer. The majority of the fill is a soft silty substance producing finds of pottery, bone, shell and a third century Roman coin. One of the important features revealed is a possible wall footing of packed flint nodules, however, the wall runs in the opposite direction to the linear features shown on the geophysics. Among the finds from the top soil contexts have been a coin of Henry VIII in mint condition, and a Roman cuneiform brooch, one of only five of similar design, from Britain. (New Find) The new season will extend the existing trench to the north, 'chasing' the wall feature and uncovering more of the building floor. The fields to the south of Old Boat Corner are part of the continuing research programme of the North Brighton Research Project. The field to the east of the Ditchling Road and south of the dew pond was the first area under investigation. Finds from the field were predominantly of flint artefacts including flakes, some tools and fire-cracked flint. The tools included a number of scrapers and a notched piece. A few sherds of pottery were recovered of mainly Roman wares, with a single piece of prehistoric material representing earlier periods. The field has a number of lynchet features visible suggesting ancient usage, but the finds collected were few in number compared to the size of the area investigated. The dot density diagrams are being created to try and identify concentrations. The field is located on the side of the valley at Coldean, close to the Downsview Bronze Age site and above the known Romano-British settlement of Coldean. A second field was partially investigated, but bad weather and the sowing of crops prevented the project being completed, the field will be walked at a future date. A number of surveying trips have been made to Stanmer over the winter months to examine and relocate archaeological features and find new sites. Millbank Wood possesses a flint cobbled trackway (pers comm. J.Driver, retired local woodsman), possibly the road to a mill known to have occupied a site in Millbank Wood. The trackway is covered by moss but is still a distinct feature running down the hill towards Falmer. A number of linear features and a very disturbed area of circular features in the south east corner of Stanmer Great Wood will warrant further investigation. A linear earthworks lies close to the cross ridge dyke in Stanmer Great Wood, but on an east/west alignment, the feature has a ditch on the north side and a partial ditch on the west with a depression at the west end. Future field activities will include surveying of these features. The annual field note book of the BHAS Field Unit is almost complete. The document gives details of all the activities of the unit including geophysics, excavations, surveying, fieldwalking and watching briefs. The publication is limited due to the costs of publication, but copies can be found in Brighton Reference Library, Barbican House Library, Lewes, the East Sussex County Archaeologist and the County Records Office, Lewes. Included in this year's note book is a section composed of tales and finds from Stanmer and Falmer, with details of memories of older inhabitants of the villages. The Society has made a number of important purchases over the past few years including the resistivity meter. A number of people have asked for an explanation into the working of the machine and exactly what it produces. The machine is comprised of 2 units, one is a fixed probe that is secured into the ground, the other is a mobile probe mounted on a frame, (the machine is often seen in Time Team). The equipment measures the level of resistance between the fixed point and the mobile unit by a series of readings. Areas such as ditches, pits and post holes are water retentive and as such allow the resistance to flow more easily, producing low readings. Walls and solid features, such as floors, are of hard materials and will produce high readings. The new resistivity meter has a data logging device to collect these readings, with up to 3600 readings a possibility before downloading the information onto a computer. 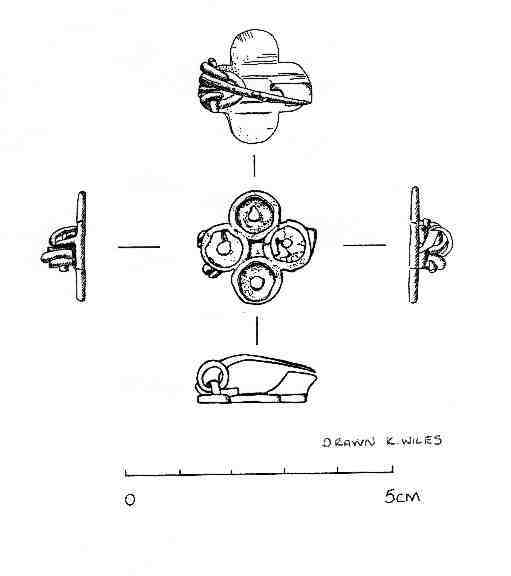 The readings produce a visual image of what lies under the ground without actually touching anything (a survey of features at Ovingdean) The results can be impressive and the results from the survey at Barcombe produced a detailed plan of the villa complex. It is not an exact science and geology can affect the results and produce similar anomalies to archaeological features (Ref Time Team Sunday 25th February where a wall feature turned out to be a natural gravel layer).